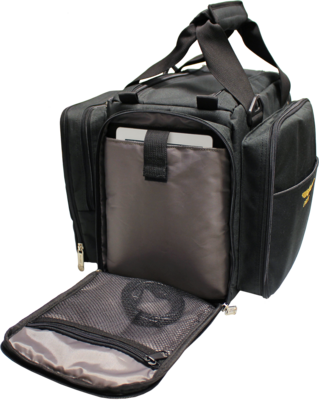 The bag is made of high-quality lightweight nylon fibre, is fully padded and has a removable reinforced bottom. The main compartment can be divided up in various ways to suit your needs. To prevent the bag from getting dirty, small supports are placed on the underside. 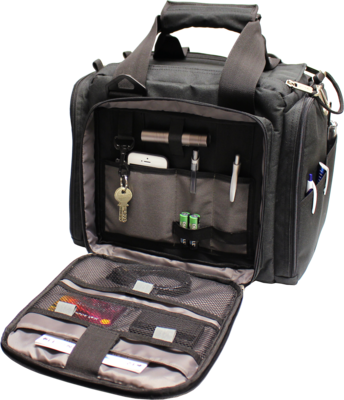 On the front, an outside pocket with a two-way-zipper allows quick access and there is another large compartment for cards, approach charts, flight plan etc. Inside, the bag has a lot of compartments, a penholder and battery holder is also included. On the back there are two outside pockets, one for GPS, radios, flashlight, charts etc. and one is extendable for headsets. On each end face of the bag there is an outside pocket. One for a tablet and the other one includes 3 mesh pockets so you can find all your items very quickly. Also included is a comfortable strap, with a padded non-slip section. With its compact measurements the CROSSCOUNTRY is the perfect companion for excursions through the country.